EV guru Craig Van Batenburg will be the feature speaker at the Automotive Industries Association of Canada’s “Vehicle Programming Today!” series of events. The Ontario event will take place April 10 at the Electric Vehicle Centre in North York, Ont. Van Batenburg is CEO of ACDC, a Massachusetts-based training centre specializing in hybrid and electric cars. 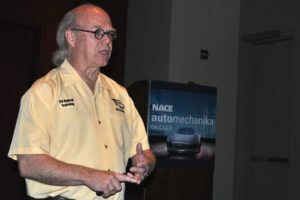 Well known in Canada, he’ll run through the basics of electric vehicle diagnostics and repair, covering the impact that EVs and Plug-in Hybrid and Electric Vehicles (PHEV) will have on the independent repair industry. This class is designed for service technicians and shop owners. Basic safety training will be covered, and by the end of the class, a technician with advanced electrical knowledge will be able to start the learning process with confidence. For more details, and to register for the event, go to the AIA website.